Someone recently pointed out to me that Napa is not really that far from where I work in Contra Costa county. This was quite an eye-opening concept to me, as it opens up new dining possibilities… After commuting by car for almost a year now, the idea of driving an hour is no longer intimidating or monumental. And so I made reservations at Ad Hoc to sample the famous fried chicken which is served only on every other Monday (it’s a good idea to verify with the restaurant about the date if you are set on the fried chicken). 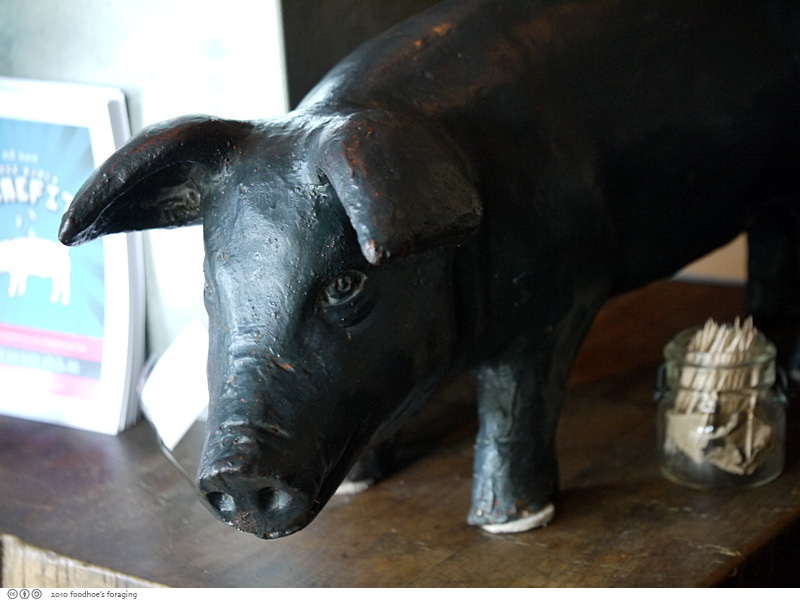 This chubby mascot greets you at the front desk. I met my SIL Casey who lives in the north bay and I rarely see anymore, but Napa is conveniently in between us. We were seated at a lovely table for two and were left to look over the menu to decide on beverages. It’s liberating when all you have to do is order drinks. We dug into the bread basket which was filled with slices of rustic country bread from Bouchon Bakery, slathering on the soft creamery butter. 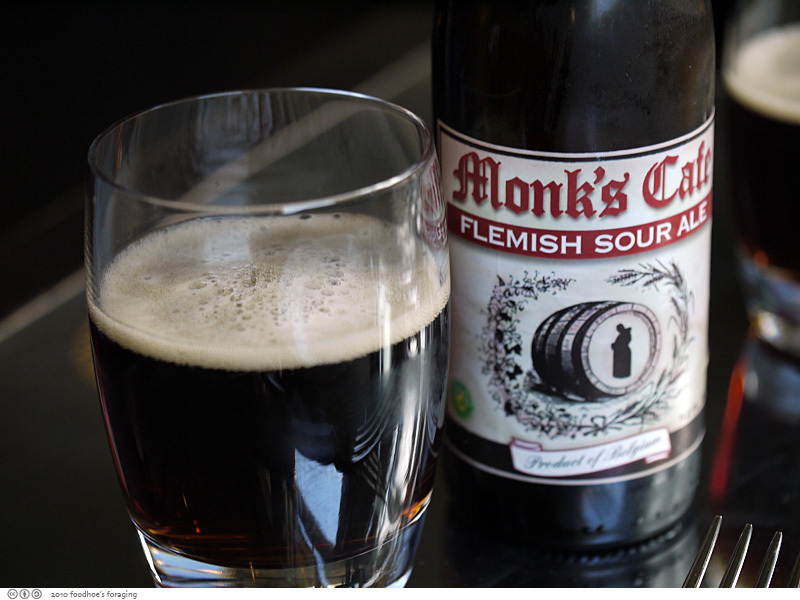 Our server recommended some beer pairings to go with our fried chicken, we started with this erm, interesting Flemish sour ale, which we split. It was sour and we agreed that we were glad we only had to drink half a bottle. The dinner menu that night was fantastic. I loved each course and we ate like royalty, enjoying some of the last of the summer tomatoes in the Panzanella Salad. 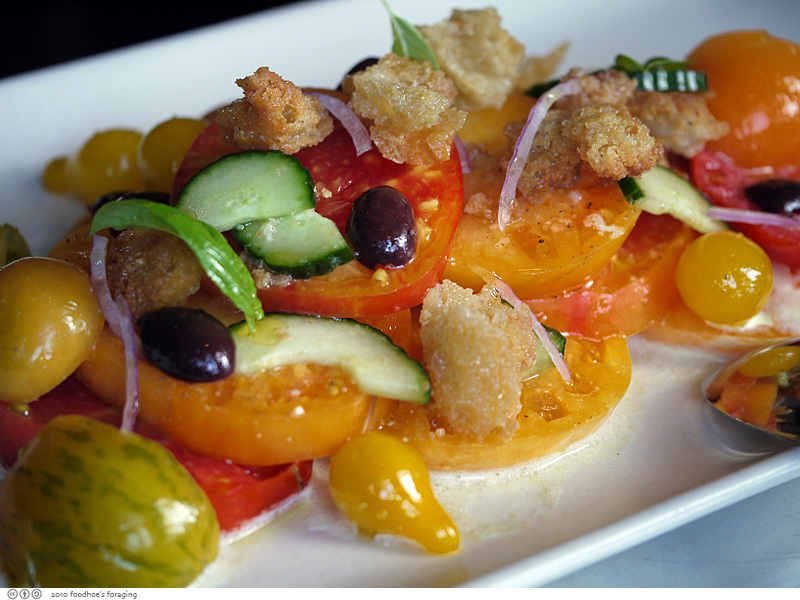 The garden heirloom tomatoes came from the french laundry garden (ooh), an artful composition strewn with slices of english cucumbers, crispy croutons, briny bits of kalamata olives, shaved red onion, and drizzled with luscious basil cream. Every bite was resplendant with the bright flavors of summer. Our server brought the Buttermilk Fried Chicken, an entire chicken (in pieces), piled in a gleaming metal pot. It glistened with shiny crystals of salt and bright green flecks of rosemary and smelled so amazing. The side dishes were quietly spectacular. I couldn’t stop eating the fingerling potatoes which were cooked sous vide and then smashed and cooked in duck fat and served with roasted bell peppers and sprinkled with chopped fresh herbs. 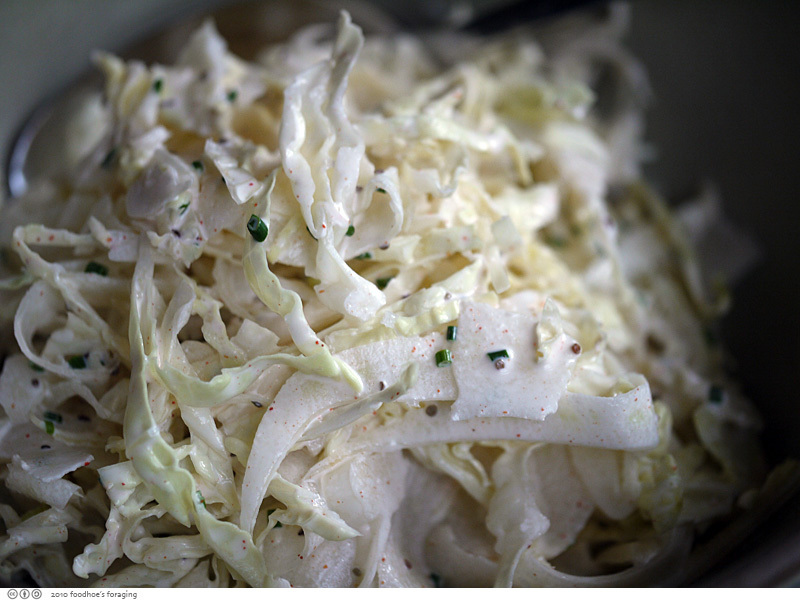 The savoy cabbage and shaved fennel slaw was lovely to look at and had interesting spices mixed in along with fresh herbs. It was bright and crisp and perfectly complemented the meal. While we ate, the sun set and the light in the dining room glowed with interesting reflections. Our final course was dessert, a Raspberry & Buttemilk Sorbet served with a delicious elephant ear cookie that was weightless and delicately crisp. The sorbet was like a very upscale version of a creamsicle. 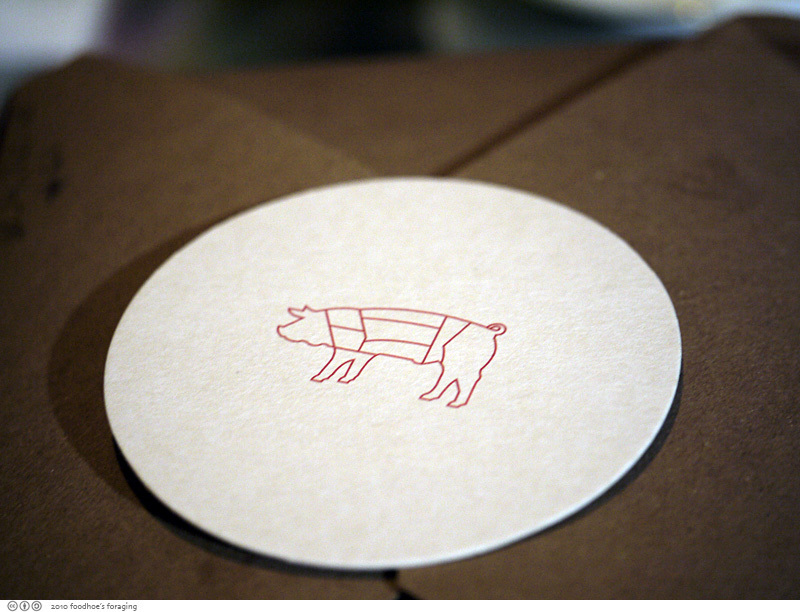 Despite heroic efforts, we were not able to finish everything, so they packed it up in a box topped with a little paper coaster embellished with the pig emblem. That coaster is evil, you bring it home and keep thinking about that chicken everytime you see the emblem. In the end, it was $75 each which covered tax, tip and one beer each. A bit pricey, but I felt it was worth every delicious penny. The good thing is that I think I am over KFC and even thinking of trying to make this recipe at home. The recipe was published by food and wine magazine here, or one that was adapted from the cookbok here has lots of pictures, or there’s the kit from Williams-Sonoma so you can have your own fried chicken frenzy at home. Wow, a place I’d love to visit! gorgeous food. Hey FH – Man does that fried chicken look great. After making the fried chicken based on the recipe from the ad hoc cookbook, I can only imagine how good that must be! 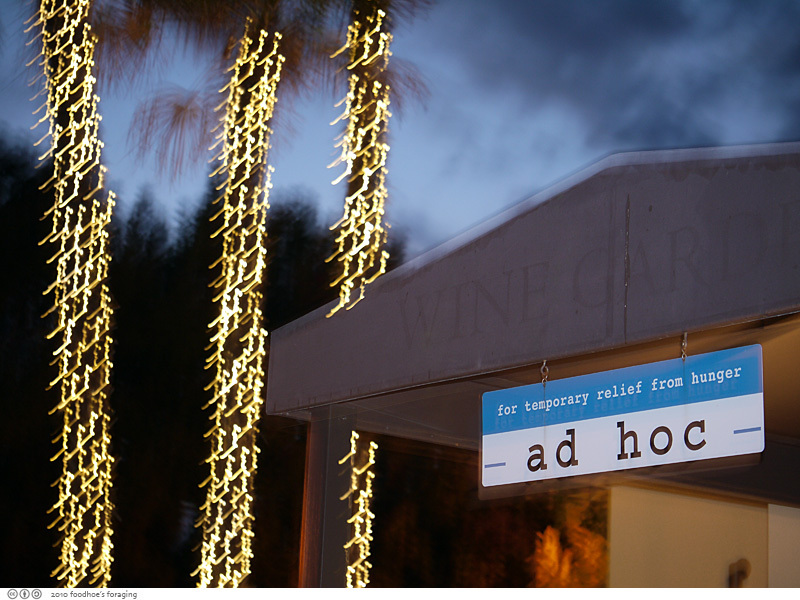 I’ve never been to Ad Hoc…your post has me poised to jump in the car though! I love the Bouchon bakery, that alone could get me driving. YOur dinner looks fantastic, worth the drive and the cash. MMm, fried chicken. 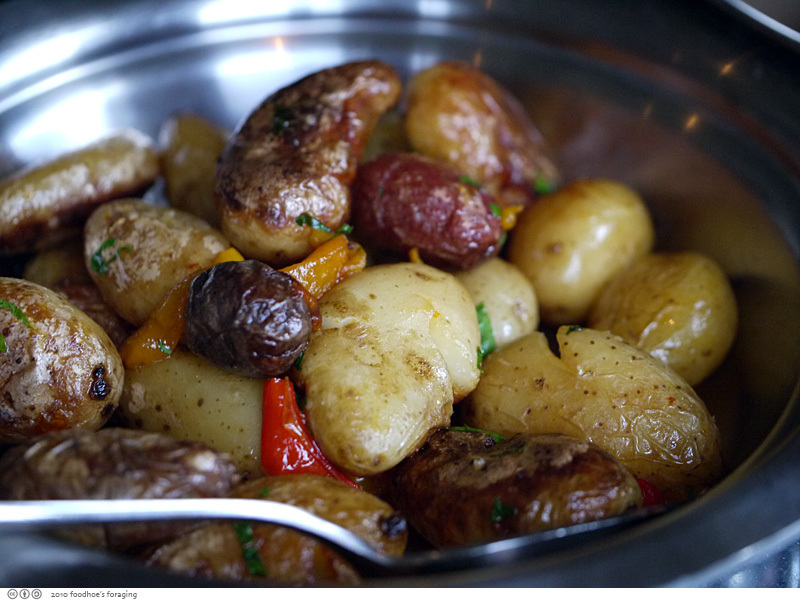 And the idea of those potatoes–duck fat? Good lord. I totally agree! 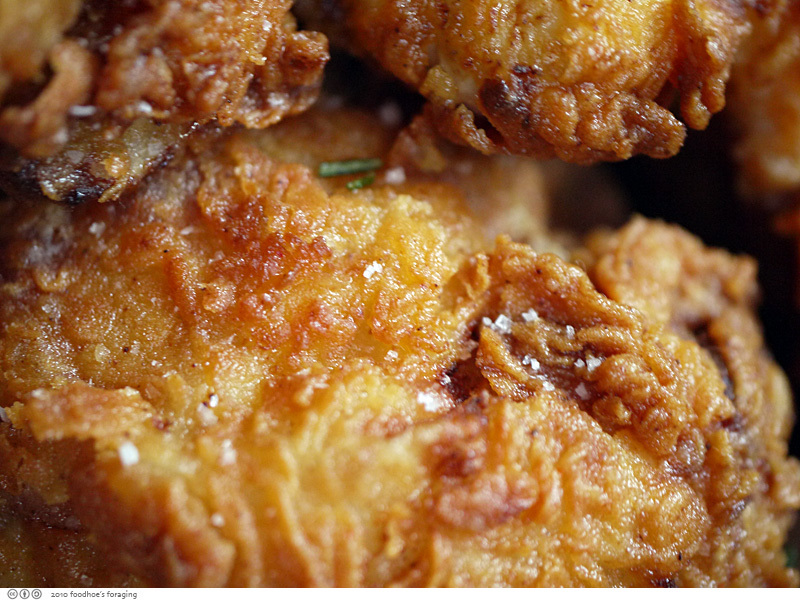 It is worth the drive for the juicy, crunchy tasty ferried chicken! I’m so glad you got the chance to try the famous Ad Hoc fried chicken. It IS worth the drive, huh! When we dined on it there, Nancy Pelosi was eating at the next table. I tell ya, everyone loves that chicken. 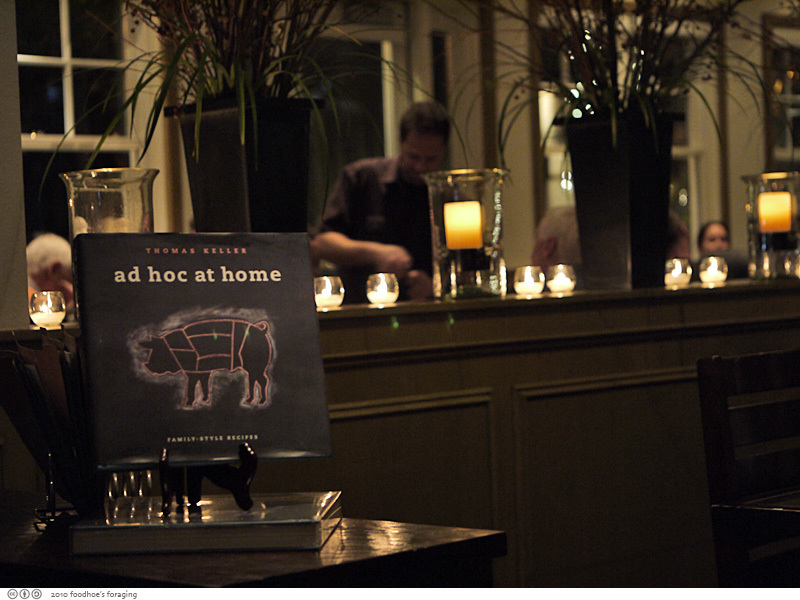 For a moment there I felt like I was reading an installation of the Twilight series…for foodies! Muchos gracias for the link…I be making like a vampire myself right in my own home! $75 is a bit pricey but for ALL the yummy food, I agree it was totally worth it! Napa is a bit of a drive for us but every time we actually make it there, we’re never disappointed! 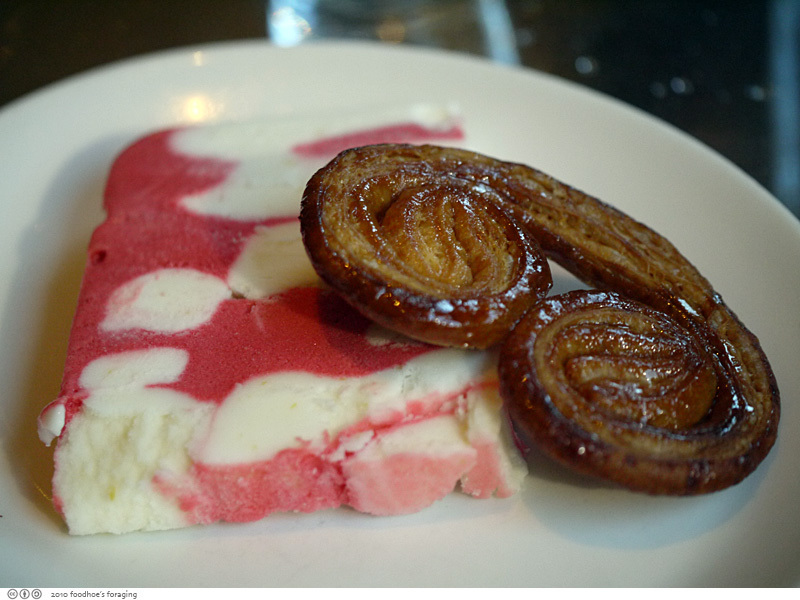 the sorbet kinda resembles a slab of uncooked bacon. that’s awesome. 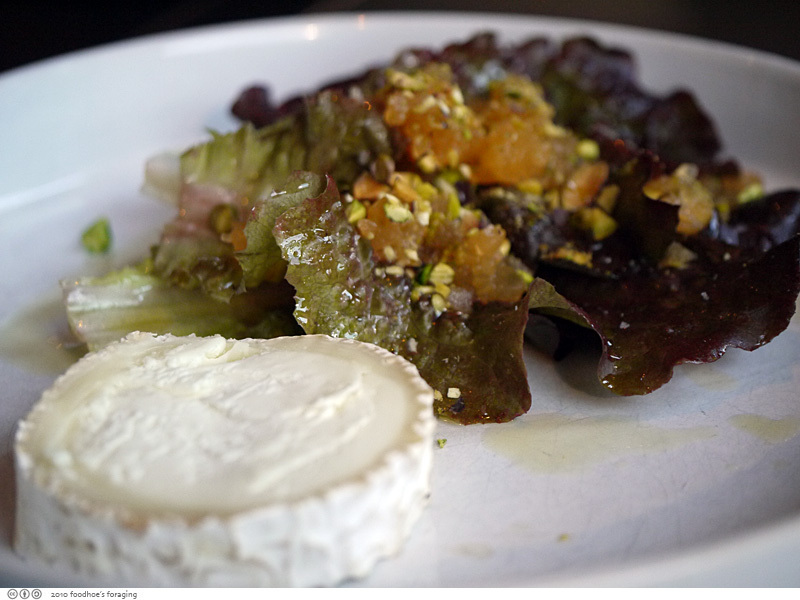 this is some gorgeous food photography and … gorgeous food! 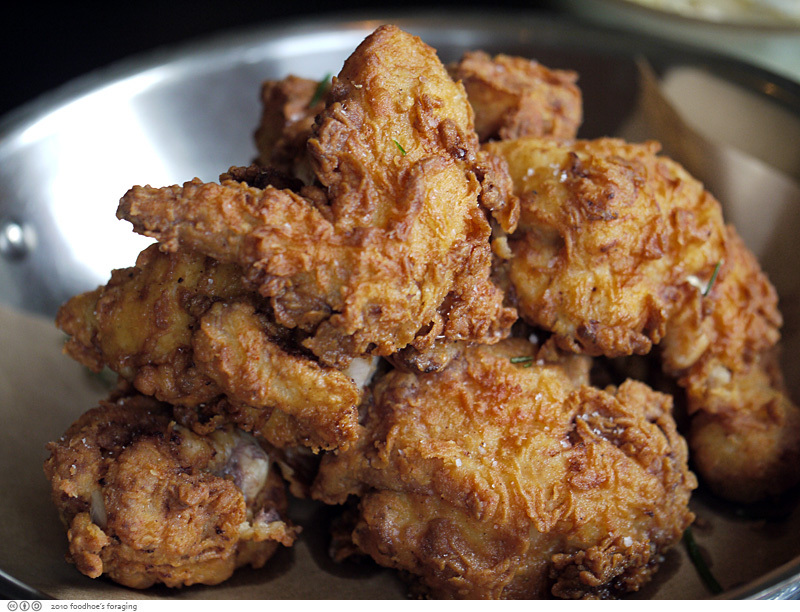 Ad Hoc has the best fried chicken in Nortehrn California, without a doubt.